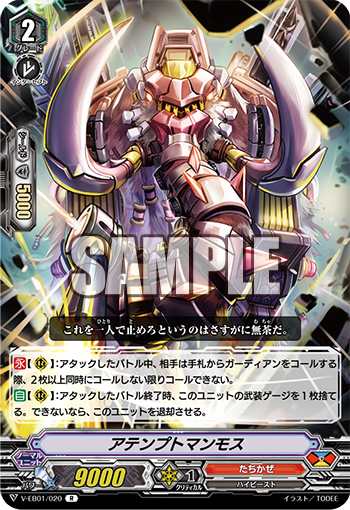 The Japanese Card of the Day for June 13th, 2019, is a Tachikaze Single Rare from V-Extra Booster 01: The Destructive Roar, Attempt Mammoth. CONT [Rearguard Circle]: During the battle it attacks, when your opponent would call guardians, if they do not call 2 or more guardians, they cannot call. AUTO [Rearguard Circle]: At the end of the battle it attacks, discard 1 card from this unit's Equip Gauge. If you cannot discard, retire this unit. Mammoth is a powerful attacker with a similar skill to Battledore Fighter over in Nova Grappler. Unlike Battledore, Attempt Mammoth is costless when using its effect, automatically requiring the opponent to waste guardians even against low-power attacks or otherwise force them to take damage. The trade-off to this is that Mammoth needs a constant supply of Equip Gauge to function, only available thus far through Sonic Noa's on-boost skill and Savage Raider's on-place. That limits your freedom to use Attempt on an Accel circle, where its skill would do the most harm to the opponent's hand. It's within reason to assume we'll see some kind of future means of attaching Equip Gauge to make the card less troublesome to play; in the meantime it seems the intended use is to poke the opponent early until you reach the point in the game when Mammoth's final Gauge has been exhausted, whereafter it becomes the perfect sacrifice target for Deathrex or another boss card, freeing up Mammoth's circle for calling out endgame attackers next turn. The previous Japanese Card of the Day was White Tight End.